I’m all sorts of thrown off this morning with the 4th of July having fallen in the middle of the week. It definitely doesn’t feel like a Thursday, that’s for sure. For those who celebrated, I hope you had a safe and fun holiday! We saw our town’s fireworks on Tuesday night and then had a cookout with friends yesterday followed by some more fireworks (in person and the ones on tv). With the gorgeous weather we’ve been having lately, we’ve been doing a ton of grilling, but I still don’t mind turning on the oven occasionally to make dinner (though I’d probably feel differently about that if I didn’t have the a/c blasting). 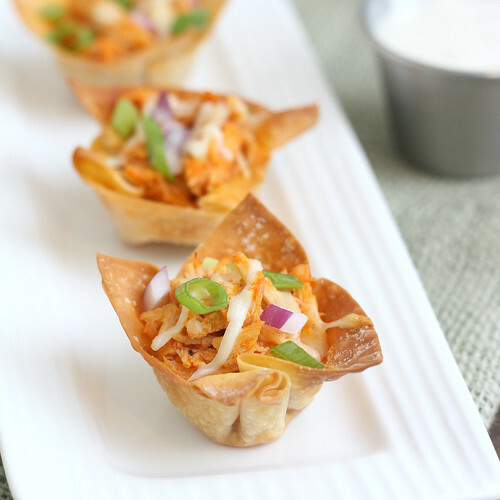 Shane enjoyed the mini taco cups I made a few months ago so much that I was eager to try a different spin on them, and this buffalo chicken variation turned out so well! I love how crispy the wonton wrappers get, and how sturdy they are – none of the breakage that sometimes occurs with hard taco shells. These were pretty hot, definitely on the upper end of what I can handle, so I had a little ranch dressing on the side. We aren’t blue cheese fans, but if you are, it’d be an obvious substitute for the mozzarella we used. There’s really nothing not to like about these – quick, easy and, like most buffalo chicken things, a total crowd-pleaser! Preheat oven to 375 F. Spray your mini muffin tin with nonstick cooking spray (mine has 24 wells-if yours only has 12, you’ll need 2). Working with a few of the wonton wrappers at a time, lay them on your work surface, and brush both sides with a little of the oil. Press each into one of the wells of the mini muffin tin – the sides will overlap and stick up over the top of the well. Repeat until you’ve brushed all of the wontons and fit each into the pan. Sprinkle the salt evenly among the cups. Bake for 8-10 minutes, or until the wonton cups are crisp and golden brown. Reduce oven temperature to 350 F.
To make the buffalo sauce: add the butter to a medium saucepan set over medium-low heat. 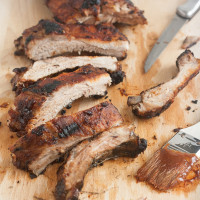 Cook until melted, then mix in the hot sauce, brown sugar and cider vinegar. Add the shredded chicken and toss to coat with the sauce. Spoon about 1 1/2 tablespoons of the chicken mixture into each wonton wrapper. Top with about 1/2 teaspoon of cheese per cup (you could use more if you wanted, but I left space for other toppings). Place the wonton cups back in the oven for about 7-10 minutes to allow the cheese to melt and warm the chicken through. Garnish with sliced scallions and/or red onion and serve with ranch dressing, if desired. 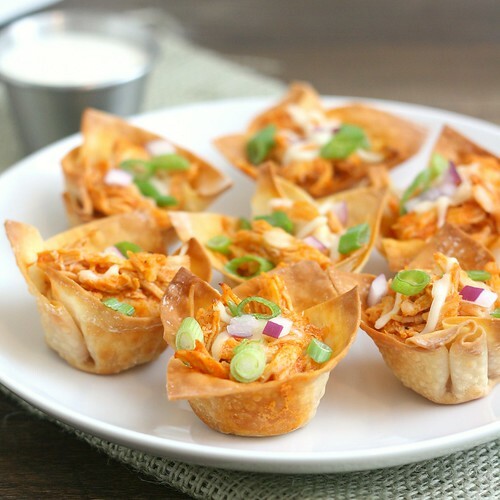 18 Responses to "Buffalo Chicken Cups"
I just made these recently and absolutely loved them, although I like that you substituted mozzarella – I’m not much of a blue cheese fan either! And the ranch on the side sounds genius! 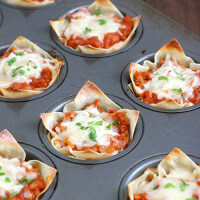 I definitely need to try the wonton cups–they’re so cute! I love crunchy things, and I bet the girls would get a kick out of them. i’m a huge lover of buffalo anything, so these look fantastic to me. i bet the buffalo mixture would be great in just about anything – these cups, enchiladas, soft or hard tacos, served over rice, etc. so versatile! Adore these, Tracey! And we make a similar buffalo sauce. 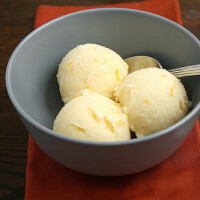 My husband is always in charge of it, he loves adding butter and brown sugar! I love savory cups! 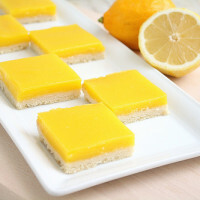 These look soooo good! These look so good! 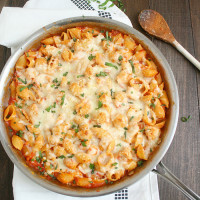 It’s perfect that you used mozzarella cheese – my hubby hates blue cheese and I’m always wondering what to sub for it. 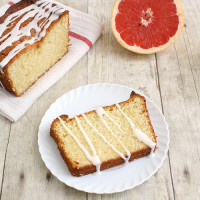 Wow, these look great..and you used some of my favorite words “Ellie Krieger”…lol, love her recipes. Will bookmark this one to try soon. I’m with you on the not heating up the kitchen deal with the grill going all summer. I think you should pin all your recipes so I can just accumulate them there…did you pin this? If so, I missed it. Sigh. These looks delicious – I love anything Buffalonian, but I’ll take the blue cheese! And, I love that it’s healthier than a chicken wing! These are so beautiful and cute. 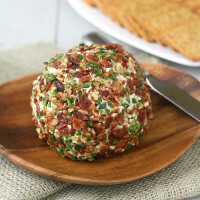 I would love to have this as an appetizer at any party! I am so thrown by this week! Holidays do not belong on Wednesdays! I love these little cups, they would be a great appetizer for any party! Oh wow! That would totally fix my buffalo chicken craving that I’ve been having lately! 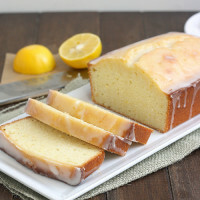 They look so delicious! I was completely thrown off by the holiday smack in the middle of the week. On Thursday night I said to my husband, why isn’t the Bacholorette recording??? Because…it wasn’t Monday. Duh! Doesn’t everything look cuter in a cup? I’m not a big buffalo fan, but your cute little cups make me want to eat them! Can I make them ahead? Will the wonton cups get soggy if I leave the filling in it? @Anonymous: I’d make the cups and the filling ahead of time, then just assemble and bake at the last minute to be sure they don’t get soggy! can these be frozen? 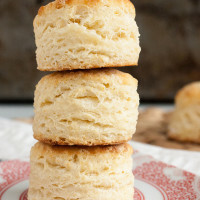 I made these for 2 days from now…how can I keep them from becoming soggy?